If this was the last few day of your problems how would you see things? …. and I’m not talking here about the last days of your life or anything like that, rather just the last few days of those things that trouble you the most, work for example, or anything else that chronically hangs over your head. Would you go about with frenzied tunnel-vision regarding your current deadline or project? Or would you suddenly more easily be able to see the big picture? Would your fears be compartmentalized rather than controlling you? Would you finally feel that you already achieved a satisfactory degree of your sought-after success and/or money …i.e., enough that you would perceive your days going forward in a more ‘content’ way, to actually enjoy them? Would the heightened anxiety and blood pressure that you often walk around with ease up a bit? Indeed, how would you feel if this was the last few days of your troubles? Would you really be able to feel it, feel the difference, your mind and your spirit relax, your foreboding and shifting fears dissipate? Could you feel something like the serenity of say, the Christmas season, with its magic as we knew it as a grade-school kid, or if Christmas has a less than wonderful connotation for you, perhaps the magic of the days as a child experiences them before the start of summer vacation? …..Why reach back that far? …because in our youth it seemed natural to snicker at the frantic pace and gravity we observed in adults, they seemed almost like they were in a different dimension, fretting and worrying about those things which seem, with a vengeance, to have become our default settings; a state of daily existence which deep down most of us are profoundly troubled by…. if so many of us did not already sense that we have taken a wrong turn with the way we lead life at some level we wouldn’t be thinking so much of how our fondest wish would be just to get away from it someday; we tell ourselves ‘a few more years of work, and I’ll cut back’, or ‘I’ll retire’, or ‘the kids will be through college’, or ‘the mortgage will be paid off’, or ‘we’ll finally pull the trigger on that vacation property’ or whatever other vision of respite or a better way that we pursue as our holy grail. And yet we know this very morning, same as yesterday, that even as we try to think on this and put it into perspective, that our default setting, at least for today, remains today’s project or challenge, and by God, our system still needs to be on high alert and our blinders up to block the beauty of the world so that we can ‘concentrate on getting this done’. In knowing that we are still not feeling better despite our awareness of this bigger picture, we are tossing the hook to the top of the chasm hoping that it catches so we can climb out of the rat-race. I’m sure there are a fortunate few who have already grasped their better way and love what they do and have no regrets, etc. But I am writing here for those of us that are in the trenches, the working men and women, trying to balance our responsibilities and survival with the spiritual big picture of our existence here. While the solution, the balance we seek, is probably on some spiritually enlightened level achievable ‘in the blink of an eye’ as they say, in reality it is a work in progress, a daily effort to reach out and remember to feel what’s truly important. So this morning, as you are tempted to shut everything else out while you concentrate on completing your tasks, take a minute to reflect on the bigger picture, and feel it just for a moment, remind yourself that in many respects you have already ‘won’ and picture how you would feel and conduct the day if it was all going to end tomorrow. 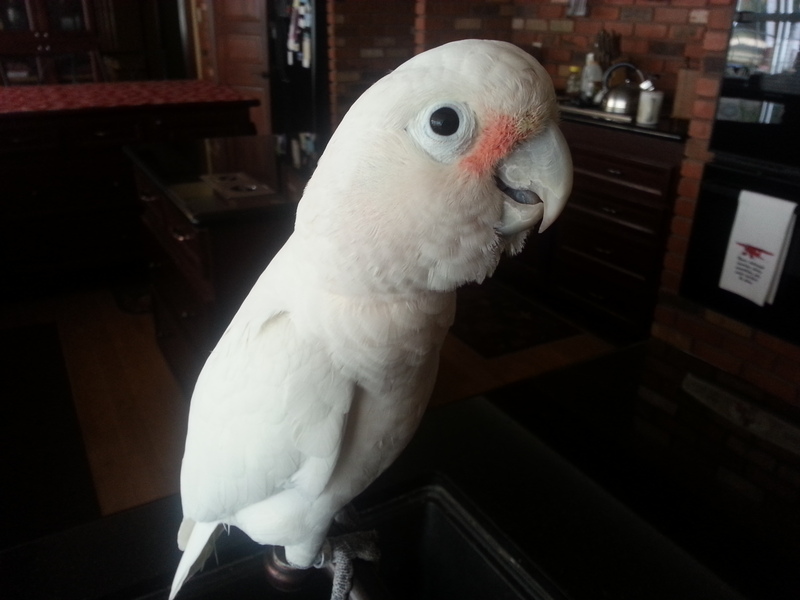 Caring for a new pet bird is a challenge! When bringing a bird home (by bird I mean a parrot) one must consider several things before doing so. First and most important, you need to know that unlike a dog or a cat, parrots in general will live for a long time. The average lifespan for a parrot ranges from 30 up to 80 years old. There are stories of birds living even longer than that in captivity. With that in mind you need to consider how old you are, how old your kids are and possible changes in your life that may make you reconsider getting a bird in the first place. Of course, age per se is not a problem unless you are 80 and in bad health and is now getting a baby bird which very clearly may outlive you. You should consider: “Who’s going to take care of it should something happen to me?”. A lot of my rescues come from families whose parents died or were involved in accidents and the children (even adults) were not able to take care of the bird(s). If you ever heard of the term “trust fund babies”, you should think about talking to your estate planning attorney or if you don’t have the means, at least consider talking to your family about what to do if something happens. Maybe even contact a rescue willing to accept the bird and instruct the family about contacting them if something happens. That way everybody can rest assured that your pet bird will have a place to go. Second thing to consider is your lifestyle. Do you travel a lot for work? Are you retired and trying to “see the world”? One thing is to take a vacation here and there but what if you are constantly traveling for work? Do you think it’s fair for the bird to be locked up in a cage and being cared for by someone else? Is that someone experienced? Is Your pet bird safe? Third, is your house safe for a bird? Do you have cats? Dogs? Reptiles? Are you still cooking with nonstick pans? Do you like to light scented candles (or those outlet scented ones)? Do you smoke (even if outside)? All of these items should be considered. While not all cats or dogs are dangerous for birds, you still need to supervise their interactions. Those cute videos you see online of dogs or cats interacting with birds are the exception, not the rule. Especially the ones with dogs sleeping near the bird or cats roughhousing with the birds. First, despite what you heard cats are not the most dangerous for birds. Except if a cat scratches a pet bird it may die within 2 hours. So ALWAYS supervise. 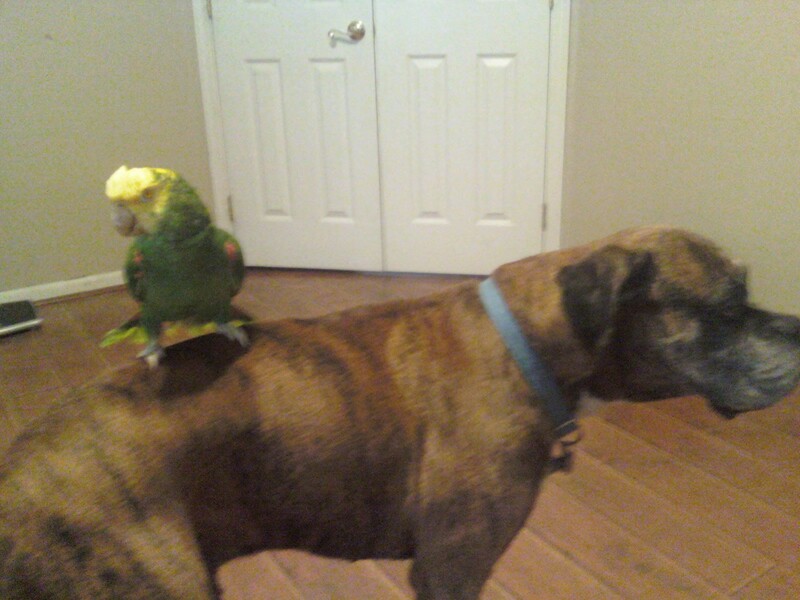 Dogs are the ones that are most dangerous to birds. Especially, bird dogs. Yes! your nice Golden Retriever may be one of them. But there are other breeds that can be dangerous to birds too. Always research and always supervise. If you know your dog cannot be trusted with the bird but you still want a bird, always keep the bird locked safely in a good sized cage when you are not around. Sometimes even lock the bird cage in a separate room. Seems pretty obvious to say this but you would be surprised how many injuries occur to birds because people trust their animals too much. You just never know. 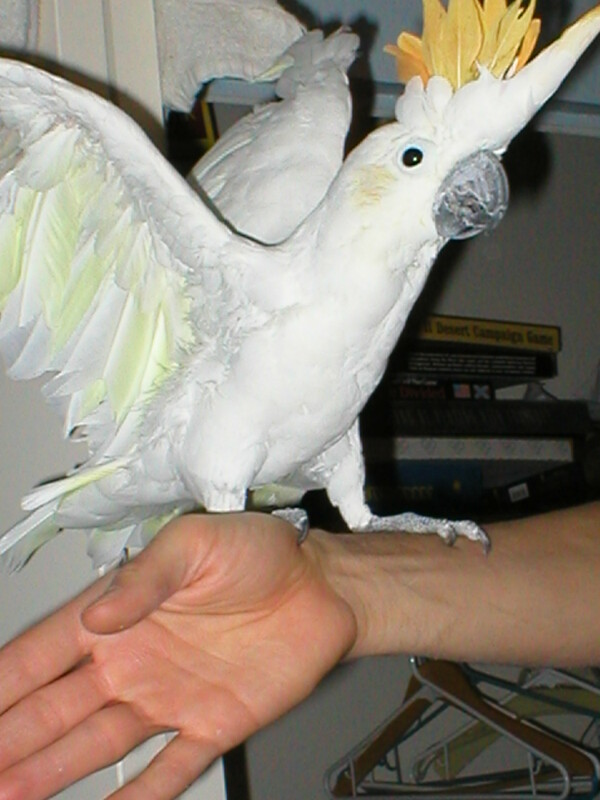 Finally, make sure you will have time to interact with your pet bird. If you still want a bird but don’t have that much time, consider getting a companion for that bird. Ideally, you do not want to breed the birds but most females do well with other females (they are also sweeter) but males can be buddies too. If you do have the time, play time and just hanging out will make most birds happy. They also don’t mind stealing food from your plate. Just make sure they are eating safe and healthy things (no chocolate, chips, fried stuff, avocados or coffee). There are other plants and food that are unsafe. Also most fruit seeds can be dangerous (especially apple, cherry, pear, among others). Well, these are a few things to think about. This post was not meant to discourage anyone from getting a bird, just to make sure that you think hard before you get one. They are a lot of fun if you spend time with them, but they do take some work too. Not only noise, cleaning and attention. Oh and don’t forget, a lot of people don’t know this but there are a lot of bird rescues out there and they are full of very good birds for adoption. Some require a class (which is excellent to learn a few things about bird care-believe me-the more I know, the less I know) I learn new things everyday and I have been doing bird rescues for years!. 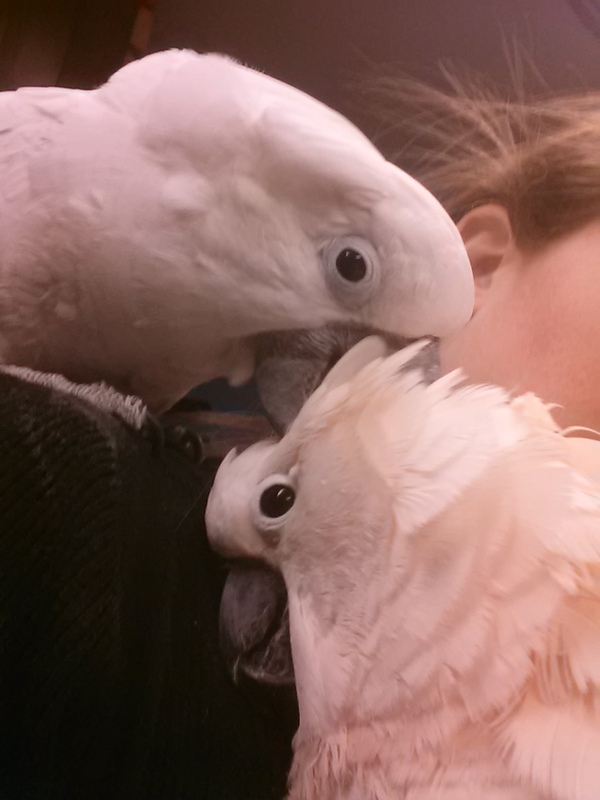 Other rescues will require you to volunteer in exchange for the bird. That way they learn if you will do well with the bird of your choice and also bird care in general. Sadly, others will just take your money and will say that any bird that sat on your hand is the perfect bird for you. Be careful! In the next post I will talk a little more about rescues and my experience with them. Always remember: Don’t buy. Adopt!!!! Feel free to ask me anything you need to know about bird care. Whether you own a bird or you are thinking about getting one.